Bialetti's glass pourover's double mesh filter allows for the coffee ground's natural oils to pass through, creating the most robust cup of coffee possible. The French press provides the simplest way of making quality, traditional coffee. Bialetti's Modern French Press in green is available as either a 3 cup or 8 cup. The French press provides the simplest way of making quality, traditional coffee. Bialetti's Trendy French Press is made from 18/10 stainless steel and a glass cylinder and is dishwasher safe. 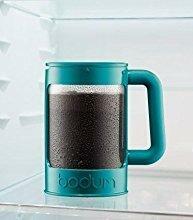 Available as an 8 Cup (33oz). The Bodum BISTRO Automatic Pour Over Coffee Machine with Thermal Carafe comes with a removable water tank, a powerful spiral heating element that brings the water close to a boil and keeps it there while transporting it through a glass pipe over to the coffee filter. There it gets distributed evenly over the ground coffee through an easy to clean shower head that's made of plastic with an inside coating of silicone. It's the silicone with its polished smoothness all through the shower holes that keeps chalk deposits at their absolute lowest and the hot water where it belongs - flowing unobstructed onto the ground beans. The result is: excellent coffee. 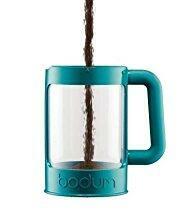 The BODUM® Programmable 12 cup coffee maker is ideal for even the most particular coffee enthusiast. It features a rain shower head that uniformly distributes the water over your ground coffee for consistent extraction and a balanced full flavour. 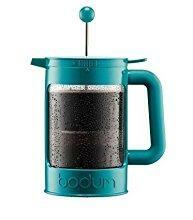 Bodum combined the skills of these Normandy craftsmen with modern production, and the result was affordable excellence. Thanks to Bodum, and thanks to a spike in consumer thirst for better coffee, the French press coffee maker became one of the most popular coffeemakers in the world. The design has not changed a bit from the original drawings, and Bodum still makes the Chambord with the same painstaking care and knowledge learned from those proud craftsmen in windy Normandy. The Chambord French Press is available in four sizes: 3 cup (0.35L/12oz), 4 cup (0.5L/17oz), 8 cup (1.0L/34oz), and 12 cup (1.5L/51oz). In terms of excellent coffee brewing, manual labor is more popular than ever (that is, if pressing a plunger qualifies as manual labor). The French press lets the coffee beans develop their fullest aroma, so it doesn't come as a surprise that it is the brewing method of choice for coffee tasters trying to determine quality beans. The simplest route to an excellent cup of coffee: coarsely ground coffee, hot water, wait for 4 minutes, and press down the plunger. The Chambord has been a classic almost from the day it came out - still is and always will be. This latest update comes with a lid that closes off the spout, which makes the Chambord spill-proof should it get knocked over. It also makes for better temperature control. The Chambord is made from borosilicate glass, plastic, chrome-plated or gold-plated steel, and silicone. It comes in three sizes: four cup capacity (0.5L/14oz), eight cup capacity (1.0L/34oz), and twelve cup capacity (1.5L/51oz). All parts are dishwasher safe. This set contains all that you need to brew delicious and fresh coffee in your own home! Bodum developed the Eileen French press coffee maker not only in honor of the great Irish designer Eileen Gray (1879-1976), but for all the coffee connoisseurs who frequent the bistros and cafés of Paris, Gray's adopted city. It's specifically designed to withstand the exacting conditions of busy café and restaurant use. A solid steel frame protects the glass from knocks and bumps, and the round handle makes it easy to carry more than one at the time. Who says you can't have your own private Parisian bistro at home? The Eileen has become an instant classic. It comes in three different sizes (3 cup capacity/0.35L/12oz, 4 cup capacity/0.5L/17oz, and 8 cup capacity/1.0L/34oz) and has all the wonderful advantages of a French press system built into its modernistic style. Eileen is made from borosilicate glass, stainless steel, chrome-plated or gold-plated steel, and plastic. All parts are dishwasher safe. 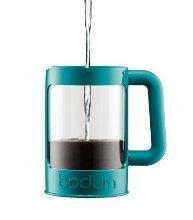 The JAVA French press coffee maker incorporates the BODUM motto beautifully; good design doesn't have to be expensive. After all, we want to give everybody a chance to brew an excellent cup of coffee in a green way.